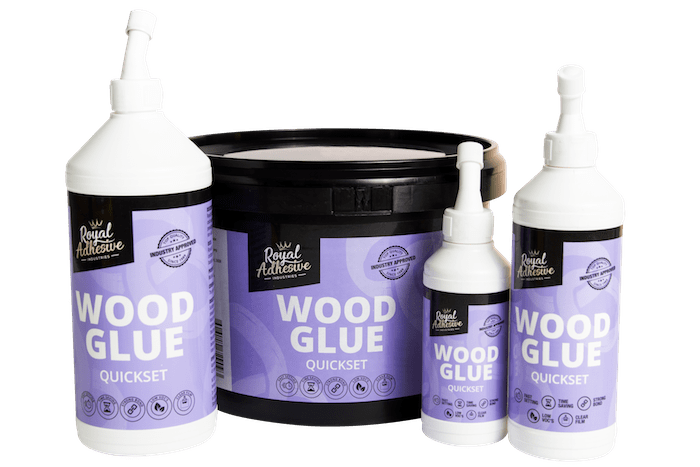 Royal’s Quickset Wood Glue is a fast setting, high-quality cold wood glue suitable for most woodworking applications, providing you with shorter clamp times. The adhesive is non-staining and dries clear. Royal’s Quickset can be used in industrial production and by craftsmen for glueing dowel joints, tenons, solid woods, laminate boards and general furniture manufacturing. Surfaces must be clean, dry and free from dust. Wood joints should fit tightly. The application can be by means of a brush, hand roller or glueing machine. Adhesives should be stirred before use and should not be used below 5℃. It is essential that the wood has an even moisture content of about 10% and has achieved equilibrium with the ambient climate conditions before attempting to glue. The glue should be applied to one surface at a rate of 150g per ㎡. Open time is approximately 6 minutes. Clamping time is approximately 45 minutes, depending on the weather conditions. NOTE: In cold weather, hardwoods should be lightly sanded before applying adhesive. Apply adhesive to both surfaces to increase the working time and increase clamping time in cold weather.